THURSDAY Highlight: Ok, we confess: The majority of Godwit Days' events are packed into the weekend, leaving the pickins a little lighter other days. And a lot are sold out already. But if you just love getting up painfully early, there was still room at press time for the "Dawn Chorus" walk in the Arcata Marsh, 6:30-8:30 a.m. How 'bout: The Owl Scouting Field Trip through the Arcata Bottom from 7-10 p.m. that speaks of "using tapes or voice calling to elicit responses from the nighttime forest owls." FRIDAY Highlights: Begin your Friday on a kayak, watching birds and other wildlife at Big Lagoon from 8-11:30 a.m. Don't like water? Sign-up for the "Birding with the Authors" marsh trip featuring Common Birds of the Arcata Marsh and Wildlife Sanctuary co-authors David Fix and Leslie Scopes Anderson from 10 a.m.-2 p.m. That night, be sure to hit up the free opening reception -- with vendor booths, no-host bar -- at the Arcata Community Center starting at 5 p.m. which features the opening lecture "Pelicans and fish waste don't mix! Rescuing and Rehabilitating Brown Pelicans on the North Coast" at 7:30 p.m. How 'bout: Educate/gross out the kiddies at the free Owl Pellet Dissection Workshop at the ACC from 4-5 p.m.
SATURDAY Highlights: Last we looked, the almost-all-day boat trip, from 6:30 a.m.-3:30 p.m., still had space for those who've just gotta spot more pelagic avianness. Other excursions throughout Saturday include a couple of "eco-tours," also by kayak, and an all-day rafting trip up to Redwood Creek. And ooo, herps! A herpetology field trip, to get to acquainted with all of Humboldt's better amhibians, 9:30 a.m.-2:30 p.m. 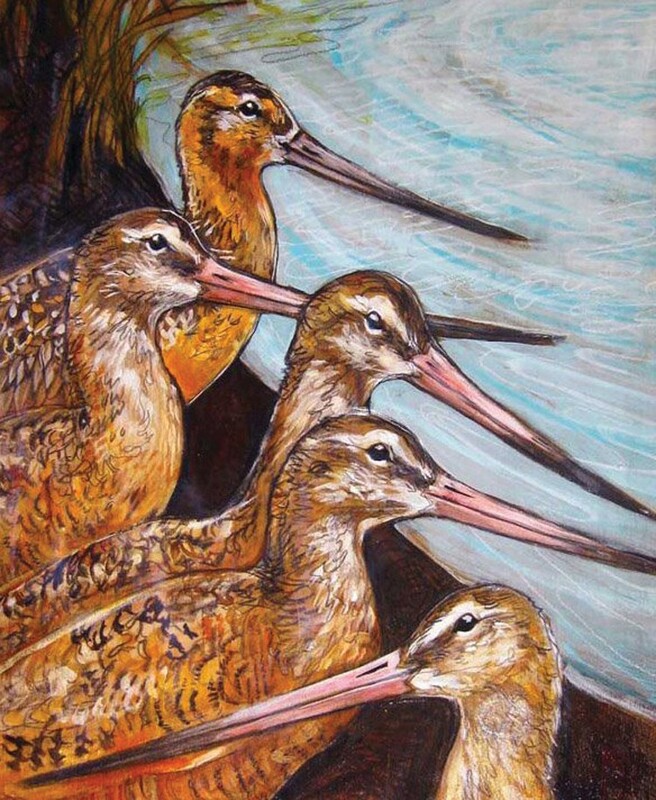 In the evening, head back to the Arcata Community Center (starting at 5 p.m.) for drinks, a catered dinner and, at 7:30 p.m., the year's keynote lecture by Keith Woodley: “In Pursuit of Champions: Unfolding the Story of Bar-tailed Godwits.” How 'bout: Want to hang out with this year's keynote speaker before he drops his wisdom on you? There's a birding trip to "local hotspots" with led by Woodley Saturday morning from 7-10:30 a.m.
SUNDAY Highlights: The most packed day of the festival features a healthy flock of tours stretching from SoHum to Del Norte County -- more stuff than we'll do justice here. If you want to stay close to MidHum, check out the "Shorebird Spectacle" at the Arcata Marsh from 11:15 a.m.-3 p.m. to see "thousands of shorebirds become tens of thousands." The day concludes at the Plaza Grill at 7:30 p.m. with the Sunday Evening Social and the Big Day awards honoring this who've seen the most fine, feathered friends (current record: 133 species). How 'bout: Take your out of town friends to arguably Humboldt's most magical outdoor locale, Fern Canyon, for an ecology field trip from 8 a.m.-noon. MON.-WED. - Highlight: True, the tours slow down post weekend. And the overnight birding trip inland to the California Lava Beds is sold out. But there's still a Muligan Monday trip, 8:30 a.m.-1 p.m, to peek at Blue Lake cottonwoods and marshy Arcata spots for birds you might have missed. How 'bout: Finish your week with the Wrap Up Wednesday tour beginning at 7:30 a.m. and hitting some of better spots of the week. The events may have wound down, but the birds remain. So, we tried to be concise and give you little tastes of this year's festival. But, honestly, that just might not be the best course of action considering there are roughly 10,000 words worth of event descriptions at godwitdays.org. Plus, you can register for all the stuff mentioned above. Yeah, that's probably best. Bird on!